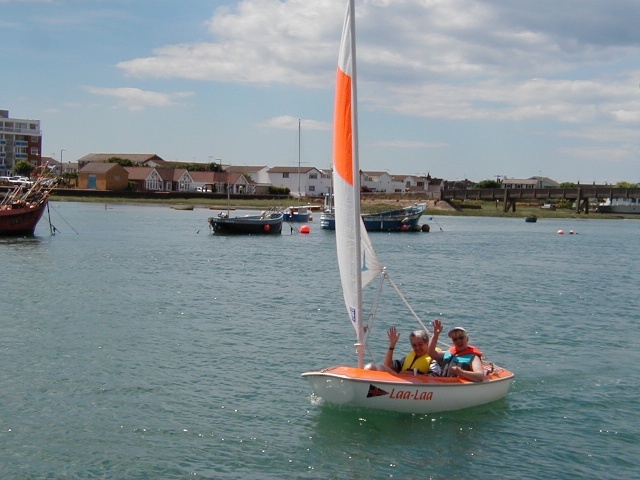 Sailability was set up by the Royal Yachting Association to enable disabled people to sail. With the aid of a National Lottery Grant, the Sussex Yacht Club set about setting up a local branch called Sussex Sailability. The main premises at Shoreham were modified to accommodate a disabled toilet, a disabled changing room, disabled parking and a lift to the bar. Club members have been very attentive to the needs of disabled people, modifying the premises and even suspending the yard and ordinary member's sailing activities when required. Our Fleet is composed of boats that are suitable for a disabled person to sail or to crew. Eight small single and double handed boats called 'Access' dinghies and three larger boats to go to sea in and carry relatively large numbers of people, called 'Sports 16'. These boats are specially designed for people with disabilities and are stable (do not capsize!). We also have a Drascombe Lugger which is suitable for people with more severe restrictions. We now also have two Sonar 23ft open keelboats which are highly competitive racing machines but can also be taken out for cruises and are often raced with the Sussex Yacht Club fleet. We have hoists to help people who would find it too difficult to get in or out of a dinghy on their own and a range of buoyancy aids and waterproof clothing. We have a lot of enthusiastic volunteers who will make sure you get the best out of your time with us. Sailability ran sixteen sessions for disabled people last year as well as a Sailing week at which tuition was given to club members. In addition the Sonars sailed independently for 40 days including competing in Cowes Week. There are volunteers to help rig, launch, recover, wash and put away the boats and also to assist the less proficient on the water (more are always welcome!). We ran inshore and cruising session for a total of 90 disabled people. A number of sailors who started with the Sailability sessions now sail regularly with the able-boded dinghy racing section of the club. Others sail with SYC members in their yachts. Six members of Sailability have also qualified in the RYA powerboat level II course. Over the year we have had a variety of disabilities: learning difficulties, hearing impaired, sight impaired and wheelchair users. Initially new recruits sail with an instructor on the river, once safe, competent and if appropriate, you can sail solo if you wish. It is always at your pace! Safety first but fun very high up on the agenda. If you have sailed before we check you out and off you go. There are sea races too. Sailability members join the Sussex Yacht Club at a special rate after an initial trial period. They are encouraged to participate in all of the club's sailing activities and social functions.